Charter brokers Vania Marafico and Judith Amselli at Ocean Independence are offering a special limited-time weekly rate on the 45.16m motor yacht Secret Life. 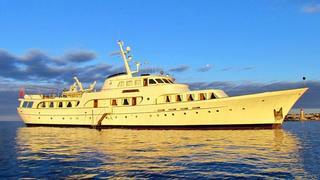 Built by Feadship in 1974, this classic yacht accommodates 12 guests in two doubles, three twins and a convertible cabin. Naturally, she comes complete with a full range of water toys. Secret Life normally charters at a weekly rate of €89,000, but for all bookings made before April 15th 2012 and taking place before the end of June 2012, the weekly rate is €63,000 plus expenses.